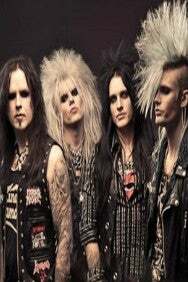 We do not curently have theatre tickets available for Crashdiet. This could be because we have simply sold out or it could be that this show is no longer running. The information on this page remains purely for historical and informational purposes. This sleaze rock band from Sweden revives 80s glam metal with a bit more punk, a rawer sound and a raunchier style.